"17 years ago, I have been the baby of the Easter Festival of Deauville!" Lise Berthaud, frequently performing on the stages of prestigious festivals and concert halls in France and in Europe, regularly shares the scene with artists such as Renaud Capuçon, Eric Le Sage, Augustin Dumay, Pierre-Laurent Aimard, Louis Lortie, David Grimal, Emmanuel Pahud, Gordan Nikolitch, Martin Helmchen, Marie-Elisabeth Ecker, Daishin Kashimoto, Ebène and Modigliani quartets. In 2009, Lise was appointed as “Instrumental revelation of the year” at the Victoires de la musique classique. She has collaborated with the Iceland Symphony Orchestra (Paul McCreesh), the Hong Kong Sinfonietta, the Moritzburg Festival, the Sunmore festival in Norway, the Berlioz Festival of the Côté Saint-André. She has also performed at the Salle Pleyel, the Moments Musicaux de La Baule, the Abbaye de l’Epau, the Salle Molière in Lyon, the MC2 in Grenoble. She went on tour in Korea for the Moritzburg Festival, she performed as a soloist at the Théâtre des Champs-Elysées with the Orchestral ensemble of Paris, and she performed in a recital at the Palazzetto Bru Zane of Venice and at the Kings Place of London. In 2013, Lise was selected by Leonard Slatkin to perform and record Harold en Italie for Naxos with the National Orchestra of Lyon. Lise was selected by the prestigious program BBC New Generation Artist for seasons 2013-2015. She was invited to play the viola concerto Der Schwanendreher by Paul Hindemith with the BBC Symphony (directed by Sakari Oramo). She was also invited by the BBC Philharmonic, the BBC National Orchestra of Wales, and performed recitals at the Wigmore Hall, the Festival des Proms, the Festival d’Auvers-sur-Oise, the Easter Festival and in Aix-en-Provence. Moreover, Lise Berthaud has collaborated with many composers, including Philippe Hersant, Thierry Escaich, Henri Dutilleux, Gyorgy Kurtag, Jérémie Rhorer and Guillaume Connesson, of whom she made the work for viola and piano in September 2007. Her recital album, made in collaboration with Adam Laloum, was acclaimed by unanimous critics: Diapason d’or, clé Resmusica, sélection Radio Classique and sélection France Inter. 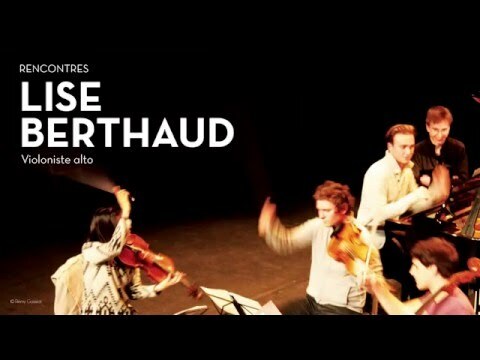 Lise Berthaud is a member of the Strada quartet, founded together with Pierre Fouchenneret and François Salque. An album of the Strada quartet dedicated to Beethoven and recorded in public in Deauville has just been released.